Destined to Reign Devotional Gift Edition is a 365 vibrant collection of devotions that will encourage readers that they can reign over hardship and destructive habits that are restricting them from victory, wholeness, and success they were destined to enjoy. These devotionals will support readers in finding strength and the wonderful grace of God, releasing a life of dead works and enter into rest, peace and the true joy that only comes from depending on Jesus Christ. A fantastic gift for both men and women bringing encouragement and hope every day of the year! Joseph Prince is a well-known pastor of the New Creation Church with over 15,000 members, and has been broadcasted on the television with his Destined to Reign course, inspiring people to live every day in the joy and peace of God. 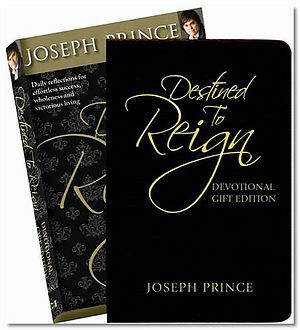 Destined To Reign Devotional Gift Edition by Joseph Prince was published by Harrison House in May 2009 and is our 13875th best seller. The ISBN for Destined To Reign Devotional Gift Edition is 9781577949794. Be the first to review Destined To Reign Devotional Gift Edition! Got a question? No problem! Just click here to ask us about Destined To Reign Devotional Gift Edition.